The set of blocks offered here cannot be duplicated. Since the 90¢ does not exist in block form, this group of blocks is considered to be a "set." Seven of the nine are the only blocks extant; we record four 1¢ blocks and one additional 2¢ block. 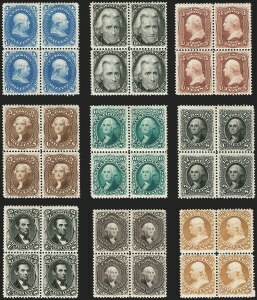 In a 1974 Jackson Winter auction, a second 15¢ block was described as the Re-Issue and repaired, but it was never certified and has since disappeared, leaving us to conclude it was either misidentified or has been divided into singles--we have removed it from the record.